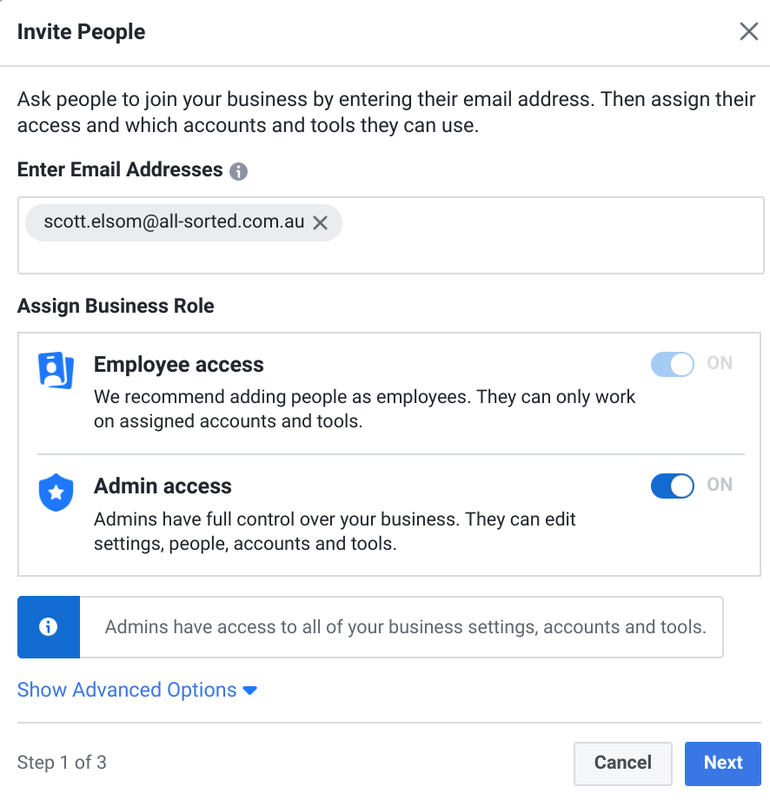 How do I add a user to Facebook Business Manager? By adding All Sorted to your Facebook Business Manager we will be able to review your Business Facebook pages, Facebook Ad accounts and Instagram accounts. We will be able to review and analyse your visitor stats and manage your Facebook ads. You’ll need to be an admin to ad us to your business Page. Learn how to see what your role is. There’s no limit to the number of people who can have a role on a Page. You will need to become Facebook friends with the person that you are going to invite before they can accept the invitation. So, send an invite to the All Sorted Staff member that you are working with. Click Users -> People in the left column. Type the name or email of the All Sorted staff member that you are working with in the box and select the person from the list that appears. Click Next and enter your password to confirm. Select the Pages tab on the left hand side and select your business name in the pages window. Select the Ad Accounts tab on the left hand side and select your the Ad Account for your business in the Ad Accounts window. If you sell items on Facebook click on the Catalogs tab on the left hand side and select the catalog for your business in the Catalogs window. Setting up Facebook Business Manager and inviting people can be complicated, so if you run into trouble call us and we’ll share a screen with you and talk your through the process. This entry was posted in Facebook Ads, Website Management. Bookmark the permalink.